In most instances, patients spend hours on these rituals and behaviors in an effort to find relief from the anxiety the obsessions cause. Panic disorder is when someone experiences repeated episodes of intense fear that cause physical symptoms. These include pain in the chest, irregular heart rhythms, breathing difficulties, dizziness and gastric distress. As with GAD, women are twice as likely to experience PD than men, and it affects 2.7% of the U.S. population. Patients develop unexpected panic attacks that interfere with their daily lives, prevent them from working and doing other activities where they might experience an attack. This condition develops after someone has been exposed to a terrifying event or ordeal, usually in which they were subjected to (or threatened with) physical harm. This is a common disorder in returning military veterans and people who have been raped, either as children or as adults. PTSD affects 3.5% of the U.S. population. The third largest mental health problem in today’s society, this affects 7% of the population. The condition is characterized by fear and anxiety over being judged and evaluated negatively by others. It can apply to a specific activity such as public speaking, or all social interactions. Hormonal changes can trigger both migraines and anxiety disorders. While women are more sensitive to these, they also occur in men. When patients experience either migraine or anxiety it makes them sensitive to changes in their physical and emotional states. When you suffer from anxiety, it can cause you to behave in ways that lead to a migraine. For example, if you’re anxious you might drink more caffeine or alcohol, or eat foods you should avoid because they trigger your migraine. Anxiety can also cause a rise in blood pressure, or a surge of adrenaline that can precipitate a migraine. Anxiety can cause sleeplessness, insomnia and fatigue, which are all triggers for migraine episodes. For patients with stress as a migraine trigger, simply suffering from anxiety can lead to the onset of a migraine. Migraine can also lead to anxiety, however. Anxiety is based in fear, and the pain of a migraine, combined with symptoms such as light and noise sensitivity or nausea, can trigger patients who fear headache attacks. It’s like going to the dentist. You aren’t afraid of the procedure, but anticipating the pain makes you fear and avoid the visit. Besides, coping with migraine symptoms is exhausting, and anticipation of this can raise the risk of anxiety. Research indicates anxiety can be a symptom of a migraine itself, thanks to chemical changes in the brain that increase your nervousness—even before the migraine develops. Studies show that exercise benefits migraineurs in multiple ways. It boosts your immune system, helps reduce feelings of depression, and promotes restful sleep. By lowering the number of headaches you experience, you could also reduce your anxiety to a manageable level. Keep a record of your food intake in your migraine diary, which will provide a baseline for determining which foods contribute to your migraine. By doing so, you can avoid the anxiety that accompanies the knowledge that you’re risking a headache, as well as issues such as comfort eating. Keeping your body hydrated is important for migraine prevention and general health. Some patients find drinking a glass of water at the start of an attack can help as much as over-the-counter medication does. Deep relaxation techniques might be able to help you deliberately unwind when anxiety sets in and ward off the tension that leads to a migraine. Follow sleep hygiene recommendations to ensure you get enough rest and avoid the anxiety that goes with insomnia. It’s important to treat each of these conditions individually, as well as examining the links between them. Prescription drugs such as triptans and NSAIDs may help to provide relief from the migraines, but won’t have any effect on the anxiety apart from reducing the reason for it. Anti-depressants can reduce your response to anxiety triggers, and natural therapies such as yoga, massage, aromatherapy, and calming herbal drinks like chamomile can help to relieve the cycle. If your doctor identifies a connection between your migraines and anxiety, it offers you the opportunity to take steps to address your condition. 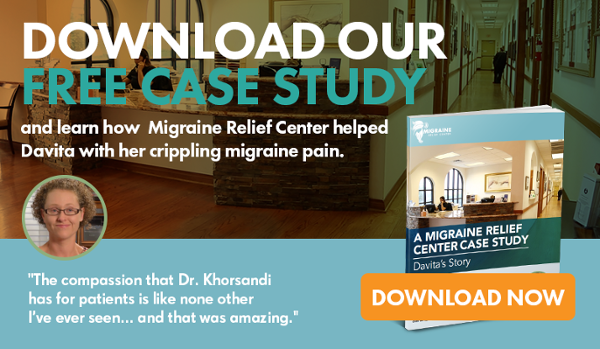 Since every patient has their own unique circumstances, it’s best to discuss this with your migraine practitioner before making any changes to your lifestyle and health care.